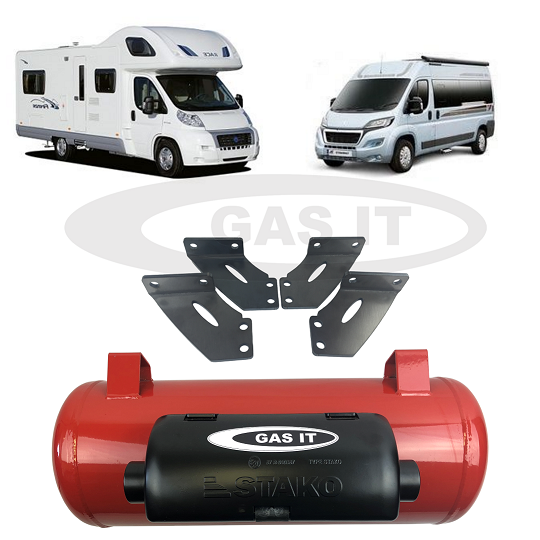 Vehicle specific gas tank systems for motorhomes, camper van, fiat, citroen, vw, mercedes and mot - GAS IT Leisure Gas Bottles, Gas Cylincers and Gas Tanks - Catering, Motorhome, Campervan, Caravan, Farrier and Road Repair Refillable Gas Solutions. GAS IT's Vehicle Specific Mounting and Gas Tank systems for domestic LPG tank installs are made for many vehicles manufactures brands and models of different ages. They are designed to not only be compliant with the relevant UK & EU regulations, but they are also made to be easy to install, easy to use but most importantly to us here at GAS IT they are Safe when fitted. Many of our GAS IT bracket systems have been designed by our own GAS IT CAD Engineers here at GAS IT HQ, who work on Refillable Gas Systems day in and day out. They are designed to be installed on certified and homologated vehicle as a GAS IT OEM part for Motorhome and panel van Manufacturers in the UK and Europe. All GAS IT brackets and mounting systems, and all our listed nuts, bolts & washer, are to the correct legal specifications. We know what you need to carry out an install on your vehicle, so we don’t only design and sell a bracket system that fits, but we also supply all the parts and ancillaries, meaning you can concentrate on the install job in hand.